This Saturday, February 26, local WNC citizens, including teachers and other public sector workers, held a rally at Pack Square Park outside of the courthouse and city buildings to save the American Dream. The rally is being held in solidarity with Wisconsin workers who have been protesting, for nearly two weeks, against a bill that would take away workers’ ability to bargain collectively and cut vital public services. The rally is part of a national day of action; events happening in all 50 state capitals are endorsed by 30 organizations, including: MoveOn.org, SEIU, PCCC, US Action/True Majority, Sierra Club, Color of Change, and Campaign for Community Change. For a complete list of endorsing organizations, please visit: www.moveon.org. At the rally, participants will protest the attack on worker’s rights and proposed dangerous budget cuts, and demand an investment in decent jobs. They will also highlight the fact that in Wisconsin, and across the country, Republicans are giving tax breaks to corporations and millionaires while cutting funding for education, police, emergency response, and vital direct services. Firestorm Cafe & Books stands in solidarity with Wisconsin public sector workers and their struggle against the state’s draconian attempt to strip them of collective bargaining rights. We have been inspired by the actions of teachers on unofficial strike, students who have walked out of class in their support and the thousands of workers who have seized the Capitol rotunda in Madison. Witnessing demonstrators occupy the halls of power is truly a beautiful and welcome reminder that resistance is not just the work of movements abroad, but also here in North America. We hope Wisconsin’s workers, having spoken truth to power, will take some of that power back into their communities, where it rightly belongs, on their return home. Wisconsin, we wish you the best in struggle but we believe that, no matter what happens in Madison, you have already set victory into motion. You have discovered, and shown us, that the power of a union lies in our hearts, our hands and our minds and not in the dictates of any law or government official. We fully support the South Central Federation of Labor’s call for a state-wide general strike as part of Organised Labor’s mission to preserve the voices of workers. On Saturday, February 26th, we will join with local workers and activists at noon in Pack Square to share our vision of a society of liberated individuals and democratic work places. Is local grain production in jeopardy? I guess they didn’t see that Gov. Perdue called for lowering NC’s corporate tax rate? If it weren’t for Unions and their fancy pensions America could fight even MORE foreign wars of nation building to provide health care for residents of former US Dictatorships. This is not a war against labor rights it’s war on the state trying to surive an out of control government union system. The stae does n ot have the money!!!! The unions have to give their share same a we that pay our own way. What do these misdirecetd misinformed folks not understand. This is not business as usual. Why doesn’t the state have the money? Why is it the employees fault the employers mis-spent the funds? The reason states run out of money is partly because states are not taxing or cannot tax the wealthy more than they tax the poor. Pensions are simply part of the wage package, like anywhere else, and no one except the workers themselves pays into their own pensions. They have a pension program because they negotiated a binding contract that makes the state pay them an amount they bargained for, and part of that pay is in the form of a pension. The war against workers in Wisconsin is a war against democracy in our economy and in our workplaces. Walker’s effort is a spiteful, petty, vindictive and vehemently authoritarian reaction fueled by his and his supporters’ extreme right-wing mania and delusion. I was there in support of the workers in Wisconsin and for workers everywhere. Workers will not back down to right-wing “free” marketeers or to T.E.A. Party fascists. It is worth noting that this is not about money in Wisconsin anymore. The unions have agreed to the wage, pension and health care concessions asked of them, and the current bill Retains collective bargaining rights for Wages. It is about achieving greater flexibility (by taking workers voices out of making decisions in the workplace) and defunding union activities (by removing dues check off). Baloney. 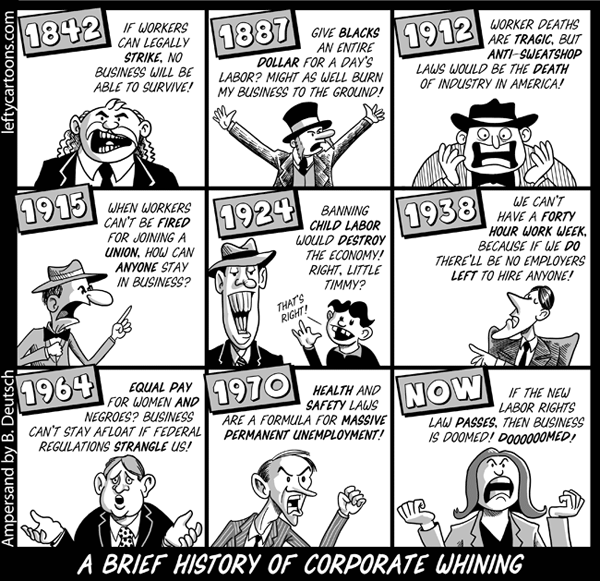 When do corporations give up any of their “share.” Their “share” is gotten off the backs of workers union or not. Their share is being grabbed from your pocket by corrupt politicians, corporations, and the financial institutions who buy the politicians. Wake up. You sound like long suffering middle class people who expect to have their pockets picked for the “good of the state?” Who got us into this mess? You and I, or the corporate white collar criminals who received buyouts and a pass out of jail? They committed fraud against the American people on mortgages and we have to give up our pensions to help them? Should we carry them on our backs to the bank, too so they don’t dirty their shoes? Political order imposed by huge corporations and banksters, Banksters who work for financial institutions “too big to fail” and who are white collar criminals given a pass by our government and “pressured in to new terms” to be better boys in the future while committing fraud and causing middle class people to starve and lose their homes. The Only terms they should get are “jail” terms. Yet people showing up to protest the crushing of unions formed in our democracy for the people and by the people and against Walker, who has been bought by the Koch brothers and other white wing extremists are considered out of “order?” Walker’s out of order. The balance of power tipping into the hands of the rich is what is “out of order.” Stop rolling over and wake up. Our country is in the hands of huge corporations and financial institutions so emboldened by our weak responses, our ignorance and willingness to be placated and to follow blindly into the morass created by biased and bought media talking heads. Wake up before our democracy is gone completely. Government by the people and for the people! Okay, I might be a grammar sticlker, but this caint be right. is This who yuns think is write! WOW…so predictibly angry and left wing and WRONG! Public unions are, by nature, oriented toward taking as much as they can from the taxpayers…something many of the loud protesters in asheville are NOT! The states don’t have money because the right wing has successfully distorted financial policy over the past 30 years. While worker productivity in the U.S. has rocketed, wages have flat-lined, as the wealthy extracted wealth from the system. Today 1 percent of Americans control more wealth than the bottom 95 percent. The bubble economies we have witnessed since the late 90s have gradually wrung the wealth out of the middle class. State retirement systems were invested in the stock market that was fraudulently gamed by Wall Street players, and the “too-big-to-fail” gamers were rewarded with bailouts while workers were rewarded with pink slips. So sales and income taxes have crashed, and states are short of funds. “Blame the workers! The greedy workers!” Let’s remember here that health benefits and retirement plans are PART OF CONTRACT PAY. They aren’t frosting. I see this whole scenario as part of the larger plan embodied in NAFTA and CAFTA to force U.S. workers to compete on an un-level playing field with foreign workers. The first step is to force down wages, the second will probably be to undercut the environmental and worker safety laws that ensure our communities are healthier than third-world hovels. Alex, how can you blame an “out of control government union system” when all the money is flowing to the bankers on top? The issue in Wisconsin and elsewhere is a direct result of the tax breaks the Federal Government via both parties love to give to those who will never be affected by any of the cuts on the local, state and federal levels. Look around at the waste of resources with money on two wars, wasted on a defense budget that props up the Military Industrial Complex, pork barrel projects that benefit the few states and cities along with earmarks, and a whole host of other boondoggles to be found within the Federal Budget. Now ask yourselves: Why do so many misinformed neighbors and friends just do not get it? Why do so many citizens vote and go along with legislation and policies promulgated by our politicians that are consistently against their own interests? Answer: Because of the ignorance of just how the game is played by those who they constantly vote into to office to supposedly represent them: Wake up people you are being played like a bad violin. It isn’t about Gods, Guns and Gays, it’ about all of our quality of life desires for the betterment of our families and society. It’s about the rest of us, the other 98% of the working citizens who need to put aside silly issues that divide us and band together to force our government to represent us, and not those who are the puppet masters who ply them into voting their way with their millions, and billions. If you didn’t figure out just who serious the weeks past news that showed how a politician can be manipulated by one of the wealthiest in their country, then we will always fall prey to the lies and actions of those who you think represent you and me. Wake up and smell the coffee American citizens, as it’s our country to lose with no recourse in getting it back for “we, the people”. You got that straight jack. The working people of America are sick and tired of being screwed by the elites and their lumpen-prole teabgger thugs. Let Madison serve as notice that we’re here to take our country back. If they de-fund the unions, they can subvert one of the Dem’s biggest campaign donors. Combine that with the Conservative activist judges who are giving corporations free-reign to donate untold amounts and you have us moving towards a truly Fascist state. Complete corporate control of the mechanisms of government. Thanks GOP! Again, funny how these very same ‘conservatives’ don’t mind spending Trillions on wars, but balk at American worker’s having a good wages. Clearly, the Republicans despise Democracy. Note to demonstrators protesting reining in the power of public employee unions: Legislation is not made based upon who can scream the loudest…..unless you are in the overwhelming majority, which you are not! Passing the proposed Wisconsin law is a given. Big picture aside, I oppose unions on a personal level: I generally vote one way, while the unions consistantly lobby for votes the opposite way. If my profession were to unionize, I will be MANDATED to pay dues against my will, which are then used to campaign for votes against my interests, thus negating the political power of my vote. Thus, my “right to work” is also my right to vote. In a Democracy, no one should be FORCED to contribute to the political campaigns of their opponents. Unions are essentially one-issue political parties. You are either IN, and have a job and opportunities, or you are OUT and have nothing. Sounds like something I read about once…oh, yeah, the Soviet COMMUNIST PARTY. Imagine that. why do Republicans only care about spending when the Democrats are doing the spending? just saying..
why do Republicans want to cut education and social services, while extending tax breaks to the wealthy, and ignoring cuts to defense, the war in Iraq, and the war in Afghanistan? just sayin..
why is it that they are so set on destroying whats left of the middle class it seems they’re oblivious to where this is going.. oh yeah, ROBBER BARONS and a an aristocracy fending off angry peasants with pitch forks. Imagine that. Big Al, I don’t think you’re big, or Al. Big Al, Both parties have used the tactic of getting out of Dodge to block votes. Legal or illegal, it isn’t anything new, and it happens within parties as well, where certain caucuses sometimes duck out of official meetings to prevent a quorum. Gallup Poll survey results published Feb. 24 found that 61 percent of Americans would oppose a law in their state if it were similar to the proposal in Wisconsin that takes away collective bargaining power of public employee unions. A pile of TAXPAYER money.